The stalemate in Springfield over the budget is turning into a prolonged fight over the direction of the state. 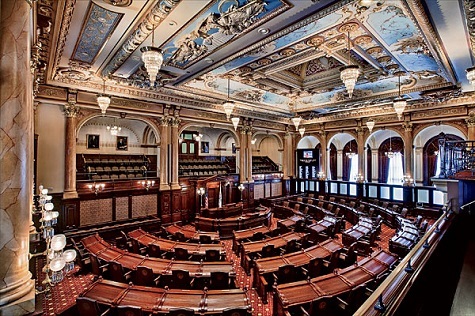 The Illinois House went home on September 24 and is not scheduled to return until October 20. While both Democratic House Speaker Michael Madigan and Republican Governor Bruce Rauner could call them back for a special session, it appears unlikely this will occur soon. The rhetoric between Gov. Rauner and Speaker Madigan doesn’t indicate a near-term solution. The good news is that while change is never easy, Illinois current budget stalemate requires a hard look at how to solve the budget gap, as well as how to address the large, unfunded pension liabilities and the $8.5 billion in unpaid bills. As Chicago Mayor Rahm Emmanuel famously said, “You never let a serious crisis go to waste. And what I mean by that it’s an opportunity to do things you think you could not do before.” With this in mind, one of the solutions offered from Gov. Rauner is sales tax reform. If enacted, the new sales tax will raise taxes between 5.0-9.25% on these businesses depending on where they are domiciled. This is will have a significant impact on these firms costs and profitability if they can’t pass along the tax to their customers. Rauner follows a unique approach to tax reform by attempting to lower the income tax rate while broadening the sales tax base to spread it out over more taxpayers. Specifically, Rauner wants to broaden the sales tax to include more service businesses. Compared to neighboring states, Illinois currently has the lowest number of service industries subject to the general sales tax. The difference is significant. According to Rauner’s plan, 32 professional and business services would be subject to the Illinois sales tax. With this plan, Rauner believes the state could generate more than $600 million in new revenue according to data from the bipartisan Commission on Government Forecasting and Accountability’s 2011 service taxes report. Services Est. ’14 Potential Rev. Est. ’11 Untaxed Rev. A sales tax is a tax on consumption and falls on those who do the consuming. The argument against increasing the sales tax is that the tax hits more heavily on lower to middle income taxpayers and therefore is seen as regressive. However, income and corporate taxes have a downside as well: they reduce the amount of labor provided and they reduce the amount of capital formed. In other words, income taxes have a larger negative effect on economic growth than sales taxes. Clearly, there is a difficult trade-off to be made between income and sales taxes. Interestingly, the types of services Rauner proposes to tax don’t appear to fall disproportionately on lower income groups. By reforming the sales tax, Gov. Rauner can improve the reliability of tax receipts (since consumption is more stable than income) as well as reduce the pressure on property taxes to solve the state budget gap. Due to the comparatively low breadth of services currently being taxed in the state, Illinois could increase this tax without seeing a large exodus of service companies leave to neighboring states, as there would be little advantage to do so. The Illinois budget battle continues in the headlines and doesn’t appear to have a solution. Yet, there are important tax changes being proposed that have the potential to increase tax revenues to help bridge the budget gap and to stabilize tax revenues for predictable spending plans in the future. Stay tuned! Disclaimer: The information contained within this report has been obtained from sources deemed to be reliable; however, we do not guarantee its accuracy. You should make your own independent evaluation of the relevance and adequacy of the information contained in this material and make such other investigations as you deem necessary, including obtaining legal, financial and/or tax advice. As of today, April 7th, 2016, Illinois' budget impasse has still not been resolved. The current sales tax in Illinois is 6.25%. Raising that will affect middle class, which will cause them to consume less, in turn lessening the revenue made by businesses. If the income and corporate tax rates are raised, less businesses might be inclined to open in Illinois and layoffs necessary in order to pay for the increased rates. The plan that the governor has in mind is only creating $600 million in revenue to solve a $8.5 billion problem. A good balance needs to be found when setting the tax rates for all involved.